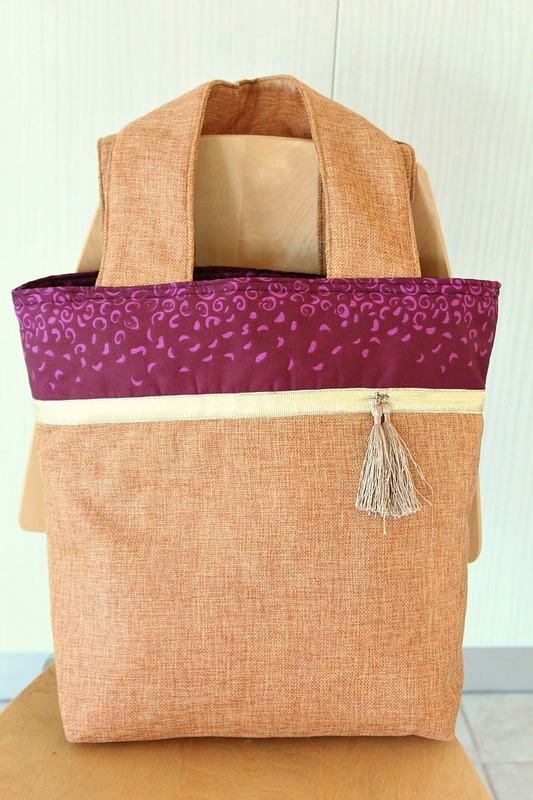 Make a gorgeous and practical two tone bag with this easy and quick color block tote bag. 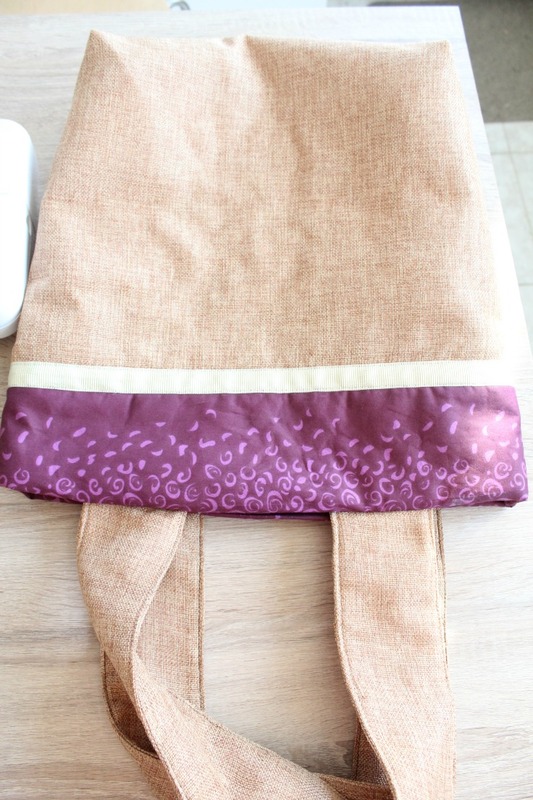 This brown tote bag makes a great project for beginner sewists! 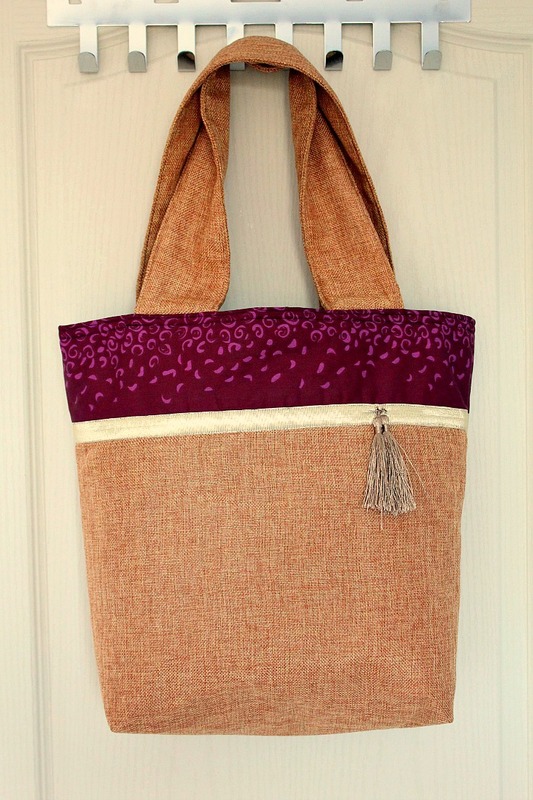 It’s the details that make a handmade bag to truly stand out, like the burlap fabric the wide, comfortable to wear handles and the ribbon in this color block tote bag. 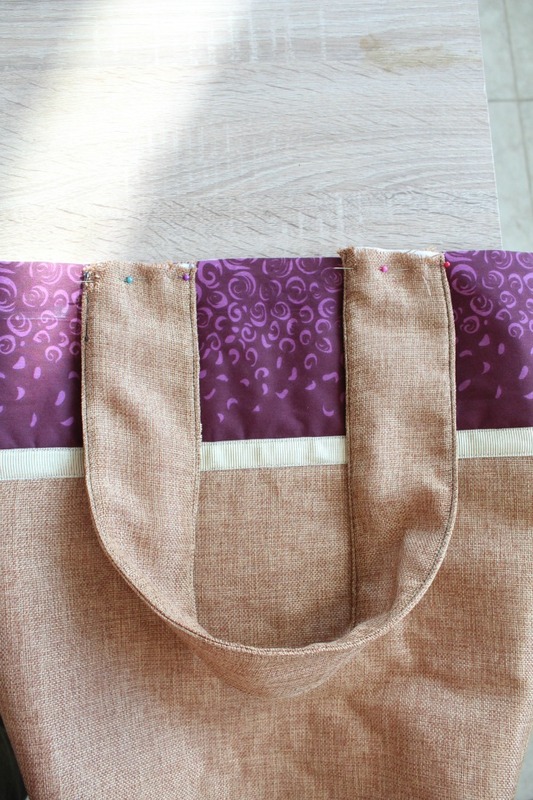 This shopping bag pattern is a medium large bag that I wanted to sew with simplicity in mind as I like clean, simple lines in a bag. The burlap fabric I’ve chosen adds a rustic touch to this bag without making it look too handmade, which I think is due to the golden ribbon addition, the pretty tassels and the extra body I gave the bag by adding some padding. I also wanted a sturdy bottom in my color block tote bag so I left the extra fabric in when I boxed the bag, on both the exterior fabric and the lining. 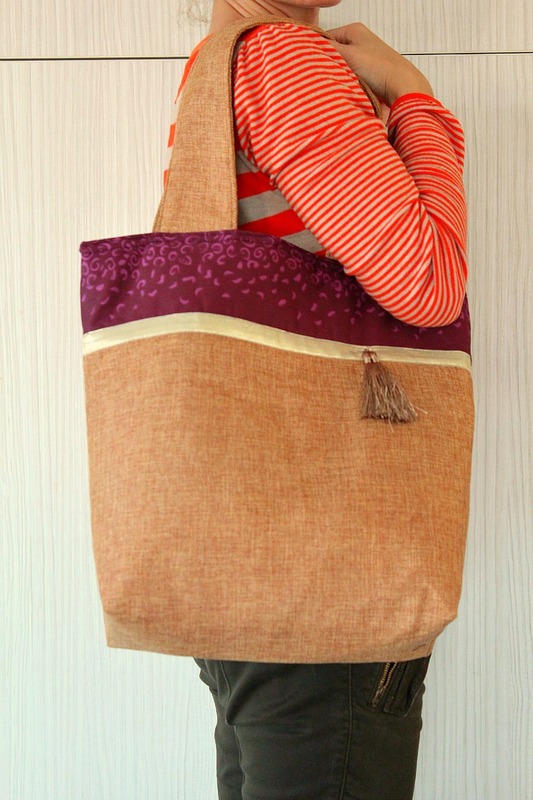 If you’re wondering why I made the handles so wide in this two tone tote bag pattern, I’ll tell you right away! It’s because all the bags I have hurt my shoulders because I tend to carry too much stuff with me. 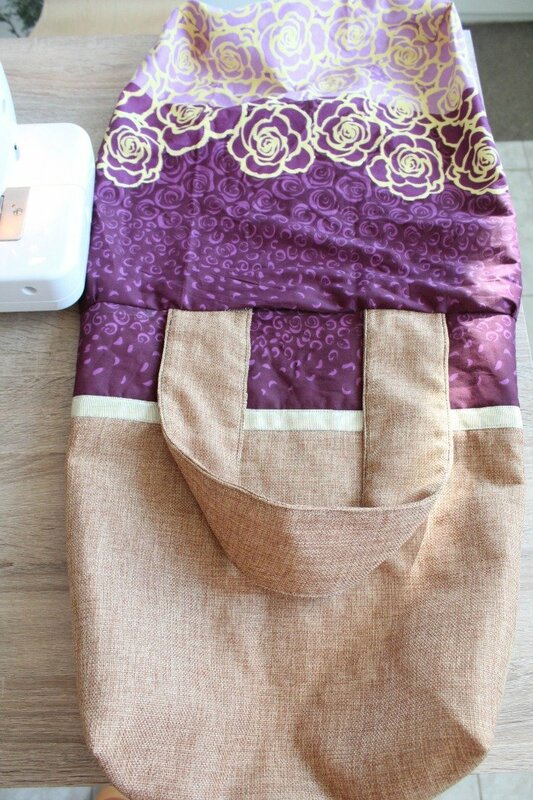 So I wanted something wider, softer and comfortable to cover a good portion of my shoulders (although this bag turned so pretty I don’t think I’ll have the heart to use it for any “heavy duty” stuff). Plus since I added some padding to the handles, it would’ve made it hard to turn them right side out if they were narrow. 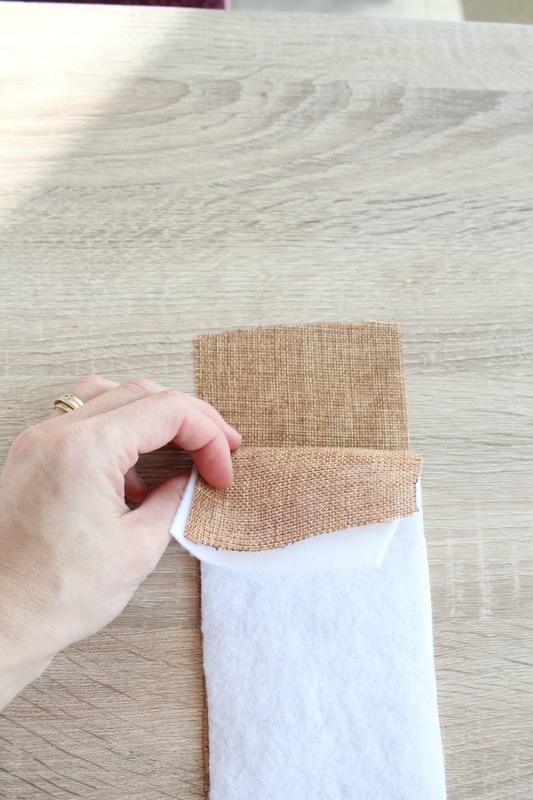 Cut your pieces of fabric, like shown below. 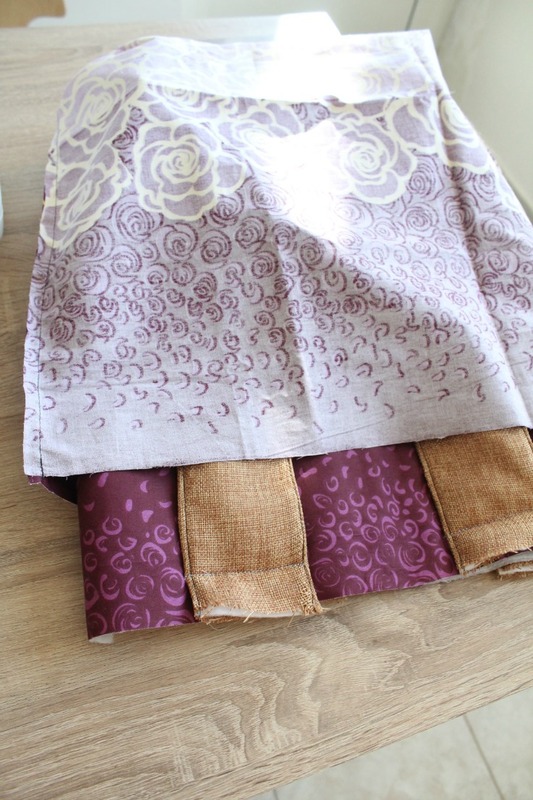 Cut interfacing or wadding to match the exterior fabric panels and the handles (so you’ll have 2 for upper fabric, 2 for lower fabric and 2 for handles). 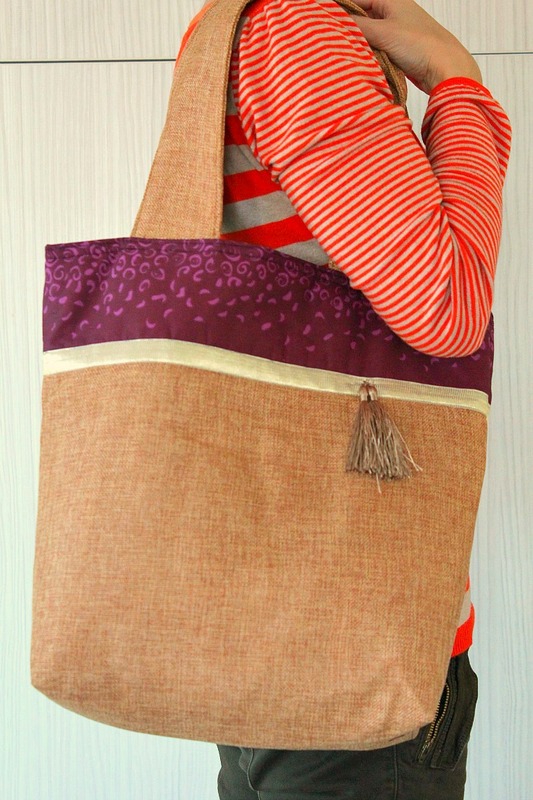 If you want a super sturdy bag, you can add interfacing to the lining fabric too. 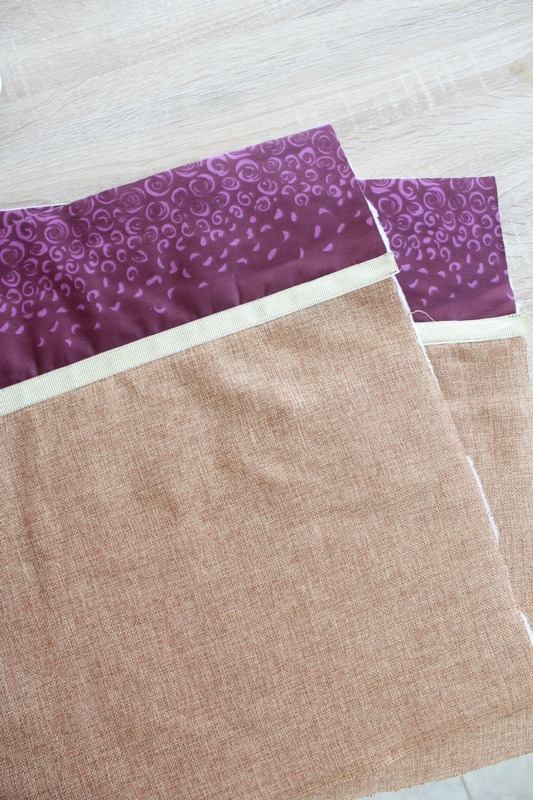 Iron on your interfacing or wadding to the fabric. You’ll have to use interfacing only on 2 of the handle panels. Grab one of your upper fabric pieces and place it together with one of the lower fabric pieces, right sides together. 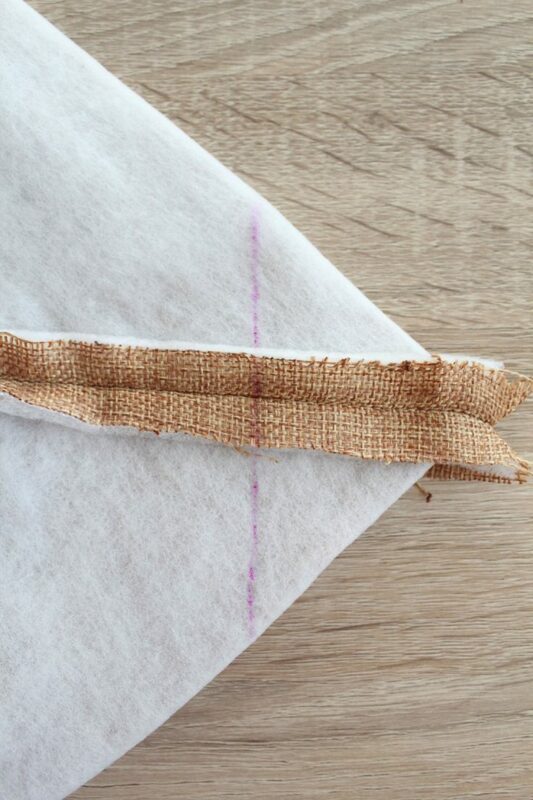 Line up the upper edges and sew them together, using a 1/2″ = 1.25 cm seam allowance. Open it up and iron flat. Repeat with the other upper and lower fabric pieces. Line up the ribbon just where the upper and lower fabric pieces join and pin in place. Sew along the top and bottom edge of the ribbon. Repeat for the other panel. Place the two panels right sides together and make sure you are matching the upper edges together. Then, peek at the sides and match up the ribbon pieces, so that they line up perfectly. 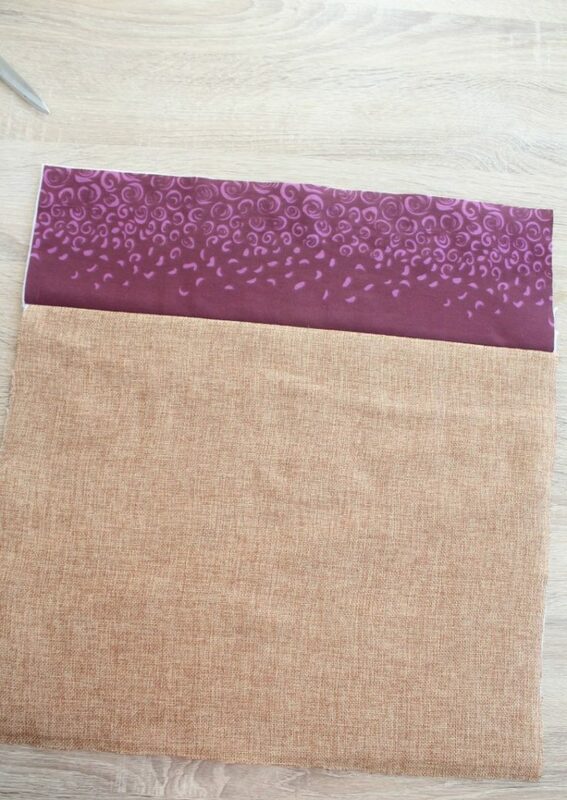 Sew along the sides and the bottom, using a 1/2″ = 1.25 cm seam allowance. 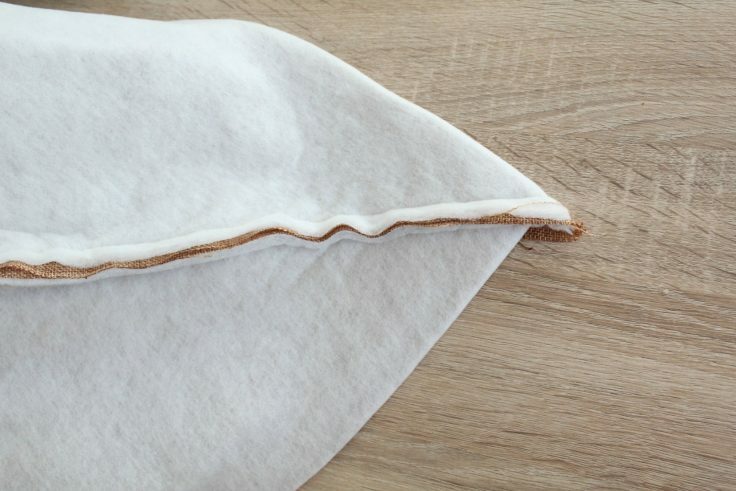 Grab one of the bottom corners and pull the front fabric away from the back fabric and fold it flat, making a nice, pointy tip by lining up the front and the back seam. Iron it flat. 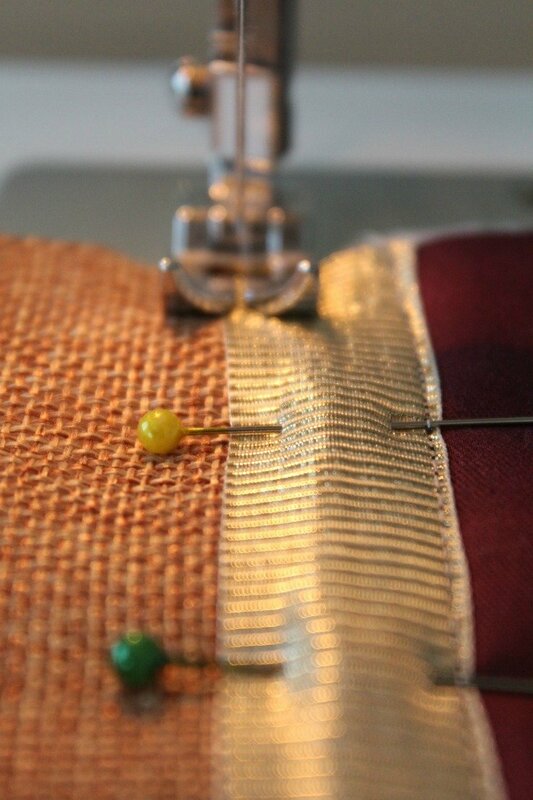 Measure in 3″ = 8 cm from the pointy corner (not the excess fabric but the corner inside of the seam) and mark with a pin. 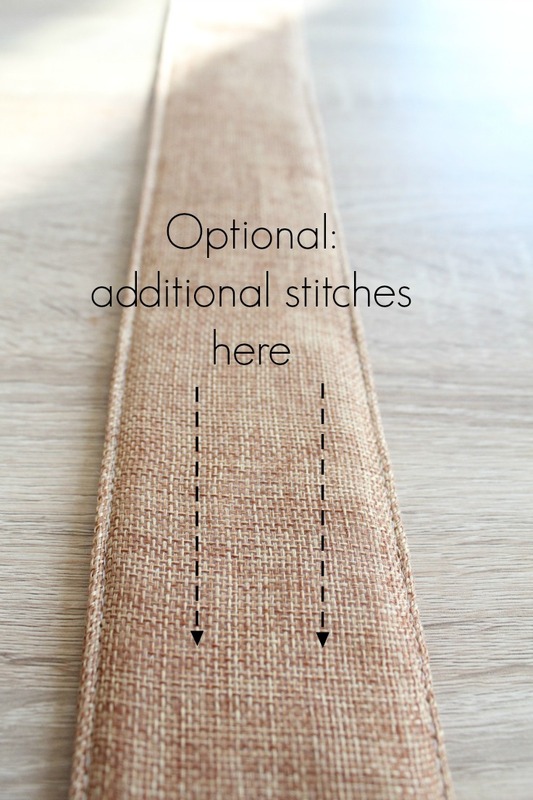 Sew a straight line perpendicular with the other seam, right at that 3″ mark. Turn the the fabric right side out and iron the side seams flat and each corner so that the bottom will stay boxed out. 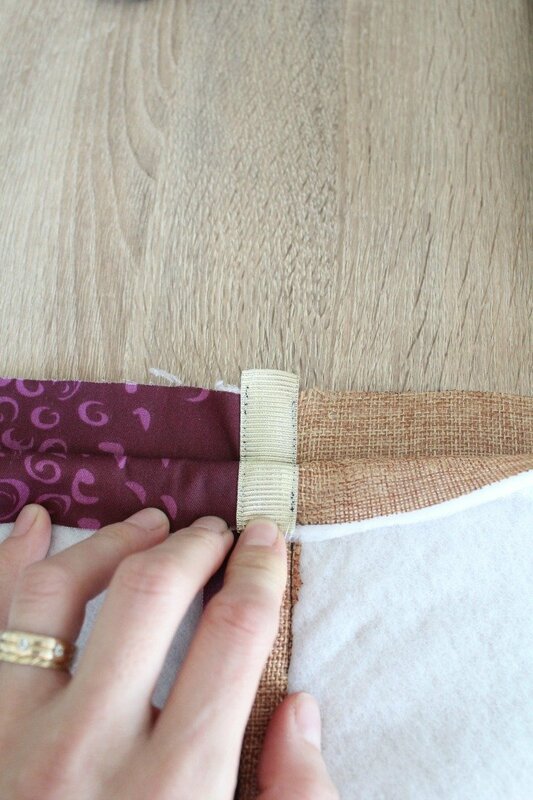 Try and flatten out the bottom seam too without making additional creases in your fabric. Repeat the process with the lining fabric, making sure you use the 18″ dimension from side to side and the 18.5″ from top to bottom. 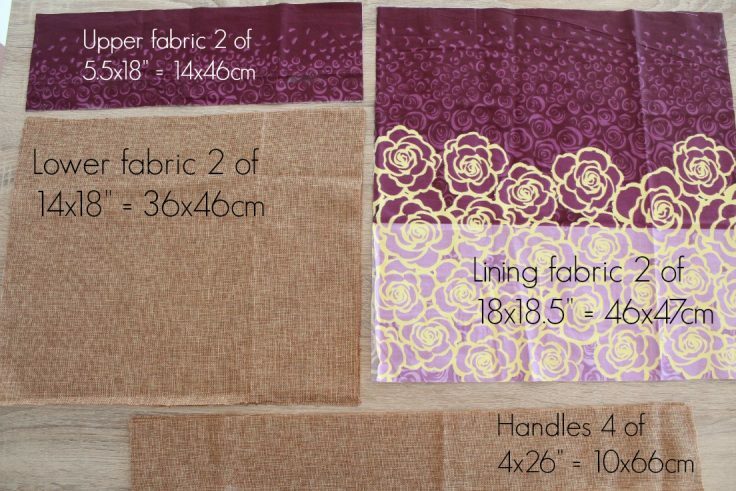 Grab one of the handle panels with the interfacing and one without interfacing and place them together with right sides together, and sew along each side, using a 1/2′” = 1.25 cm seam allowance. Do the same with the other handle pieces. Leave both ends open on both handles. Turn each handle right side out, and press flat. Sew along the edge, on the sides, as close to the edge as possible. 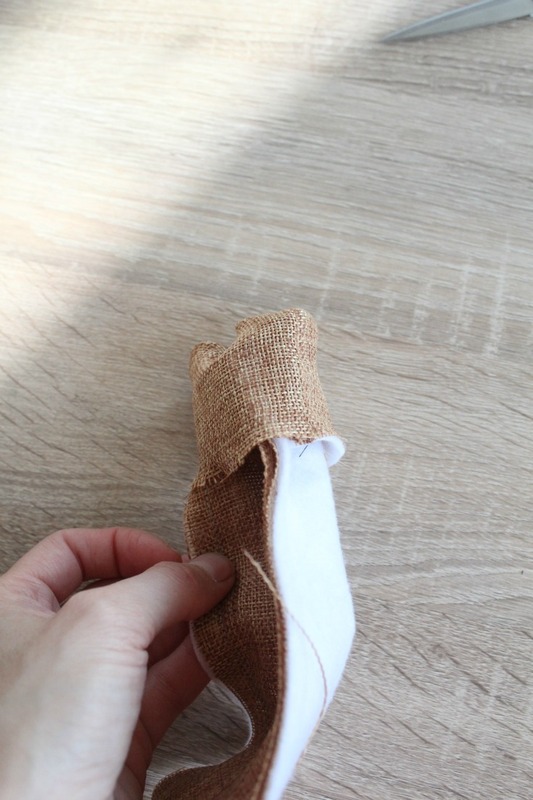 Make additional stitches inside the handles, for added design if you wish. Grab one handle and place each end 4″ = 10 cm from each side seam. Pin both ends in place. Do the same on the other side of the bag with the other handle. 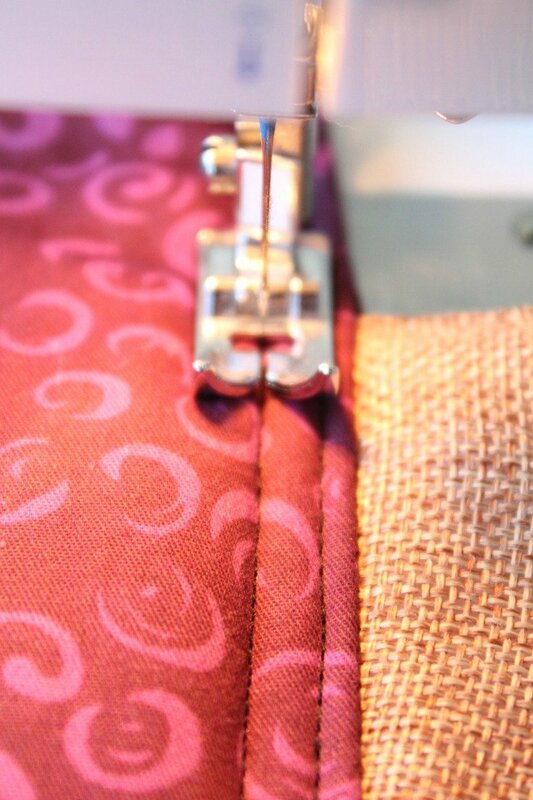 Sew each handle end in place, using a 7/8″ = 2.25 cm seam allowance. 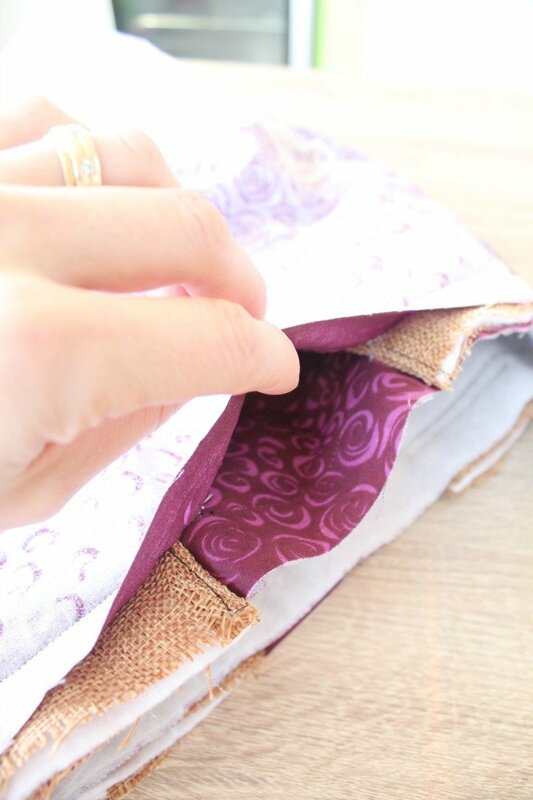 Slide the outer bag fabric – right side out, inside of the lining fabric – inside out. Match up the top seams and the side seams and pin in place. 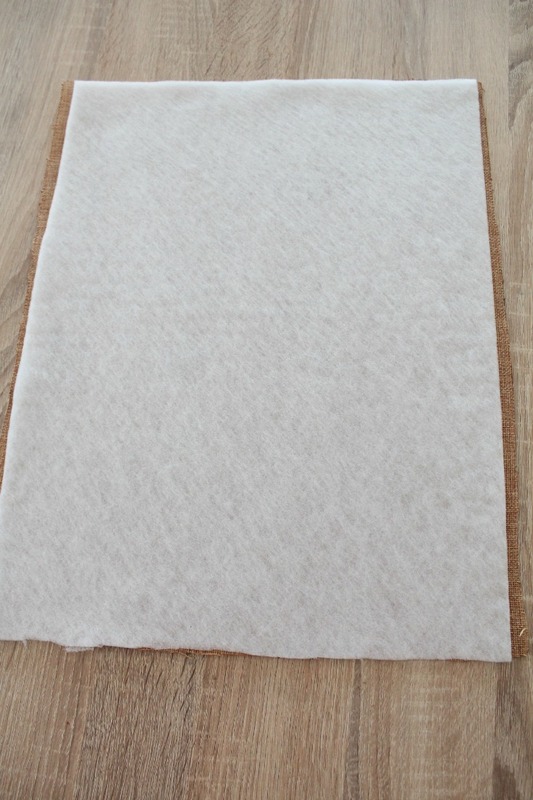 Sew around the top edges, using a 1″ = 2.50 cm seam allowance. Leave an opening between the handles on one side so you can turn the bag right side out. Then, pull the outer bag fabric out, through the opening that you just left, until all fabric is right side out. Tuck the edges of the opening towards the inside, 1″ = 2.50 cm and iron flat. 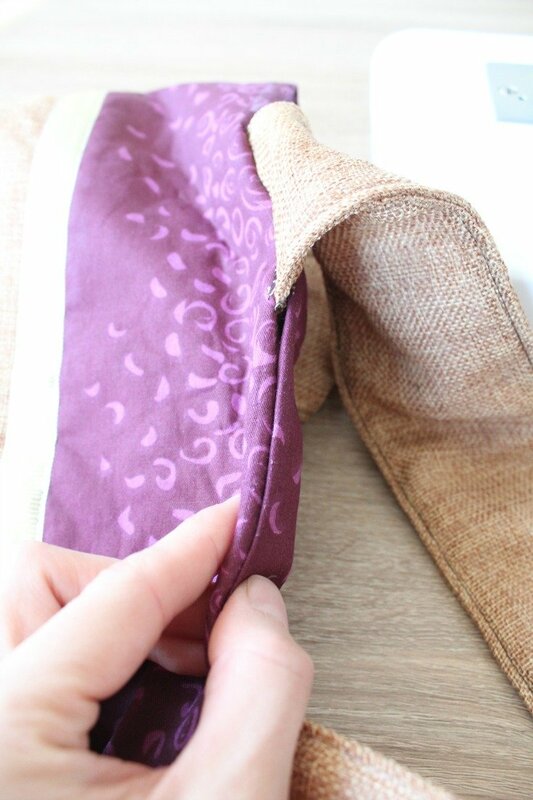 Close the opening by sewing all along the upper edge of the tote, where the outer fabric meets the lining fabric. I added an extra stitch, 1/4″ = 0.60 cm below the upper stitch as added design and to give the handles extra strength. Now you can embellish your bag with tassels, stitched to the ribbon, a fabric flower or anything that might strike your fancy. And that’s it! The instructions on this color block tote bag may seem like a lot but it’s only because I wanted to show photos and detailed instructions for every step. Making the bag went on really easily and smoothly though! 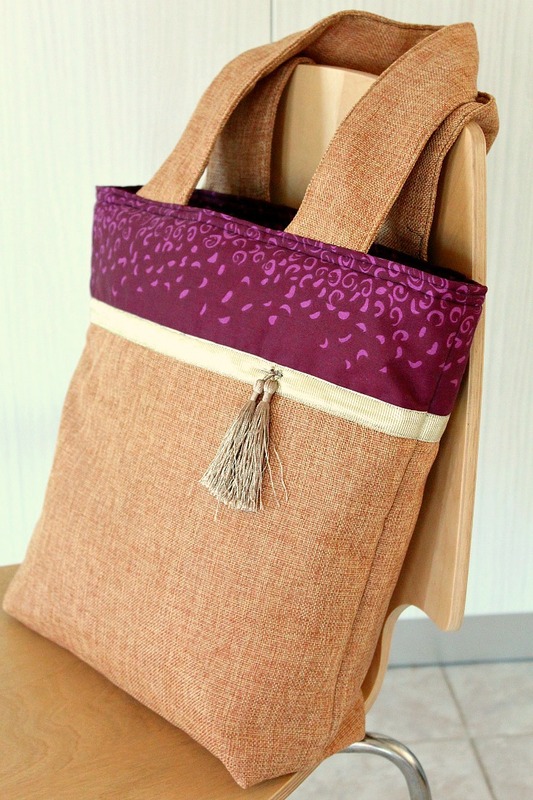 I love how pretty and sturdy this tote bag turned out and I plan to make a couple more in different fabric choices. Maybe change the design a bit too. Or the pattern. Oh, the possibilities! I loved these ideas. 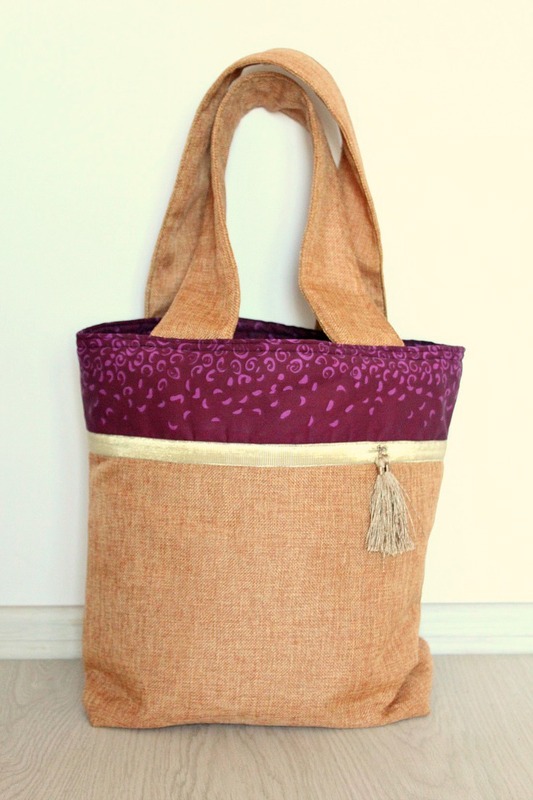 I have been looking for a simple tote pattern so that I can recycle my chicken feed bags into totes or bags with handles.. I am really excited about this project. Thank you so much for the instructions and photos. I might have had several botched attempts without your tutorial, so I am very thankful. I just found you through Hometalk. This bag is gorgeous! I may try making one next summer…I haven’t done any sewing since my mother-in-law passed away, she was my sewing mentor. I have signed up for your newsletter and am excited to follow you. Aww, thank you so much Lisa. You have no idea how much joy you just brought! My dad passed away last week and I feel totally lost and not much can motivate me these days. Nice comments like yours remind me I’m surrounded by beautiful people and that my work here does matter. That’s more than enough to get me back on track. Thank you so much again!